After the hairdressing incident whereby I got attacked by a pair of scissors and instead of ending up with shorter layers only around the front of my face, I ended up with them right the way around. So the only way to get rid of said layers was to take a step back and start looking after my hair. If you are a regular reader of the blog you will know that I've been using Lee Stafford's Hair Treatment (review) on my hair which has been working really well. However as my hair grows fairly quickly I have avoided getting my hair cut every other time since the incident. 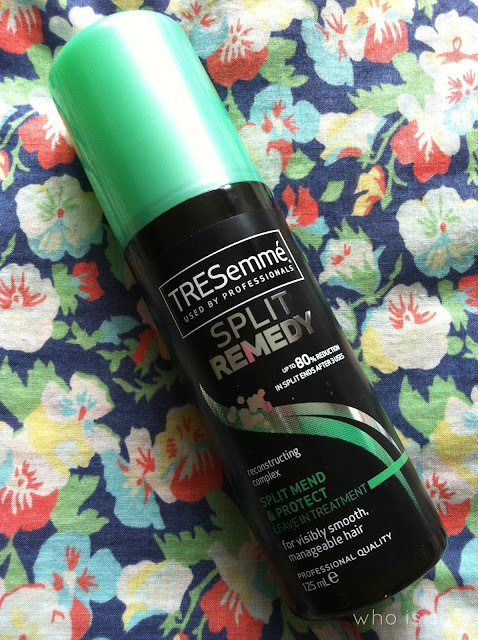 From only getting my hair cut every 10-12 weeks I'd noticed that I was getting more split ends than usual and after a quick shout out on Twitter, most of you had recommended the Tresemme Split Remedy range. Now previously to this I'd only ever used the colour protect shampoo and condition which I wasn't that fussed over and their heat protector spray which made my hair greasy so that got passed over to JEM. So when chosing a product from the range I wasn't keen on trying any of their shampoos/conditioners. I spotted this leave in treatment on the shelf for about £4 and I thought I would give this a go. Actually I've just remembered I also use their hairspray- I'd recommend it (will do a review). Honestly if you suffer from split ends or want to protect your hair I would definately recommend this. Before getting my hair trimmed I honestly thought that the product was doing a good enough job. After towel drying my hair I use a pea sized amount and use this on the ends of my hair- literally just the ends, then style as normal. I've continued to use this since getting my hair cut (5 weeks ago today) and as this month I have hammered the styling tools on my hair I can honestly say I have hardly no split ends. I'm not preaching that this is a HG product, however if you want to prevent split ends I really recommend this, just use a tiny amount. Plus its excellent value for money and you can find it in your local supermarket as well as Boots and Superdrug. Are you a fan of the Tresemme range? ?